Students have an informal knowledge of percents from newspaper ads, weather reports, and television commercials. Certainly they see percents as grades on their tests and quizzes. Researchers have found that building upon this knowledge as well as students’ intuitive knowledge of visual proportional estimation (e.g., estimating that a jar is half or 50% full of liquid) helps students make sense of percents and rational number (Moss, 2005). But their overall understanding of percent is limited in both depth and breadth. In this Project M3 unit, students strengthen their understanding of ratios and proportions and make connections to number concepts and algebra as they develop their understanding of percents. They begin with an area model of percents as part of a whole in Chapter 1. They connect percents to different representations of the same number using fractions and decimals. 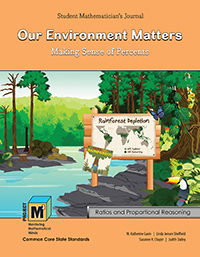 Once students have an understanding of percents as a part of a whole and have had experiences exploring an area model, they begin using percents to solve contextual problems related to land conservation. They learn how to solve percent problems using double number lines, bar models, and by setting up and solving proportions. They also solve percent problems by writing and solving equations with variables to reason about the quantities in the situation. In Chapter 2, as students begin examining issues with water conservation, they learn how to solve percent of increase and percent of decrease problems using diagrams as well as equations. They also work with markups, markdowns, and sales tax and see how retail makes extensive use of percents. Throughout Our Environment Matters, students have an opportunity to solve many practical applications all related to an issue that is important to them, protecting and saving our environment. As a culminating project, they get a chance to go shopping (virtually) as they purchase products to help conserve their home water usage.